Aberdeen City Councillor Ryan Houghton; Lt Colonel Geraint Davies, Aberdeen University Officers Training Corps and Neil McLennan, Chair, War Poets Corner Committee (Scotland) and senior lecturer, at the University of Aberdeen. The life and work of Aberdeen's greatest war poet has been commemorated with a plaque on the building in which he grew up. 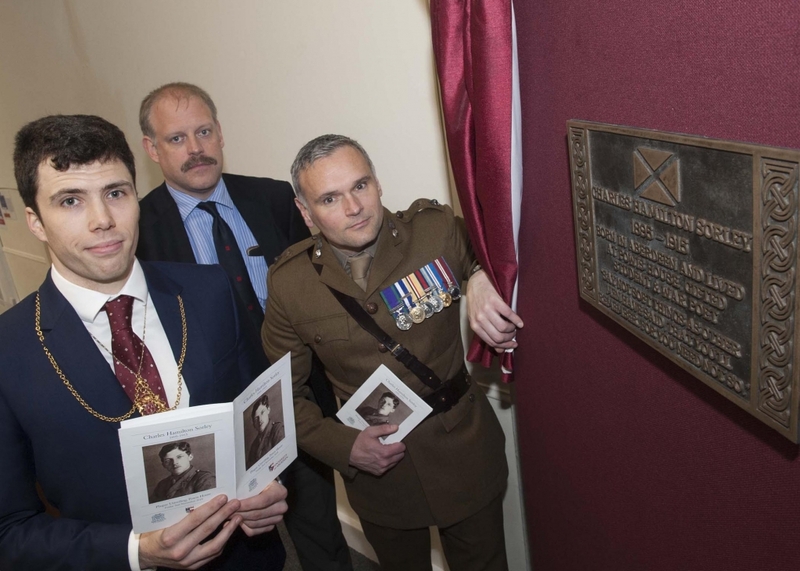 Aberdeen City Councillor Ryan Houghton, who has seen active duty in Afghanistan when he was in the RAF, unveiled the plaque on behalf of the Lord Provost and the people of Aberdeen on Friday November 2. Charles Hamilton Sorley was born on 19 May 1895 in Aberdeen and lived his early years in Powis House, which is now Powis Gateway Community Centre. He was the son of a University of Aberdeen professor, William Ritchey Sorley, who taught moral philosophy. Sorley was just 20 when he was killed by a German sniper’s bullet during the Battle of Loos in 1915 but when his work was published posthumously a year later, it made a significant impact. He was described by poet, writer and critic Robert Graves as “one of the three poets of importance killed during the war,” alongside Wilfred Owen and Isaac Rosenberg. Sorley had been studying in Germany at the outbreak of the First World War but following a brief internment returned home and immediately enlisted as a second lieutenant in the Suffolk Regiment. He was sent to the Western Front in May 1915 as a full lieutenant, saw action at Ploegsteert in Flanders, and was promoted to captain that August. But like many, his life was cut short at The Battle of Loos; an ambitious attack planned by Sir Douglas Haig. Of the nearly 10,000 British soldiers who attacked, 385 officers and 7,861 enlisted men were killed. Among them was Sorley, who was shot in the head by a German sniper on October 13. His body was never found. Neil McLennan from the University of Aberdeen has conducted significant research into Scotland’s war poets and spearheaded the campaign for recognition of the contribution made by Sorley, and other north-east poets, to our literary heritage. The plaque dedicated to Sorley comes as a result of the efforts of Scotland’s War Poets’ Corner Committee chaired by Mr McLennan. The plaque has been awarded under Historic Environment Scotland’s 2018 round of the Commemorative Plaque Scheme, which celebrates the lives of significant people by erecting memorials on the buildings where they lived or worked. Councillor Ryan Houghton said: “Aberdeen has been involved in many wonderful commemorative events to mark the Great War over the past four years and the unveiling of a plaque in recognition of Charles Hamilton Sorley is a timely and fitting permanent marker of Remembrance for the city’s greatest war poet. “Thanks, must go to the Chair of War Poets Corner Committee and the education, arts, civic and business groups brought together to ensure that there is a plaque for Charles Hamilton Sorley. Professor George Boyne, Principal and Vice-Chancellor of the University of Aberdeen added: “Charles Hamilton Sorley is Aberdeen’s greatest war poet and had strong connections to the University of Aberdeen through his father, who lectured here. Despite this, his work is not widely known in the city. “The University has previously paid tribute to his memory with an event at the 2016 May Festival, on the centenary of the posthumous publication of his work, which demonstrated the enthusiasm of the local community for a lasting memorial to his legacy.